Taylor Brooks - clever, endearing mini-bio. the day the iPhone released apple's stock jumped up from $85.47 a share to $97.00 a share. that means if you had $1000 worth of shares the day before macworld, the next day you had roughly $1135 on paper. to me that doesn't seem that much. i think a lot people are persuaded by the hype in the stock market. i don't think $135 dollars in a day is that great of an investment. if you make $50,000 a year you make more than $135 in a day... "well that's just one day," you may say. i understand that. ok, let's go back further in time. anyway you can see that beginning in early 1999 the stock started to rise from $10 a share to it's peak in the first quarter of '00 at $34 a share. dot com'ers made there money here. using the example above, if you held $1000 worth of shares in the end of 1998 and rode the stock all the way to its peak in 2000; your $1000 turned into $3400. a ridiculous gain of $2400!!! so why am i writing this? if you look at the graph you'll notice that in September of 2000 the stock took a nose dive all the way down to less than $8 a share. if you held the stock and didn't sell at the peak, you actually lost money. the days of making quick money on one stock like people did in early 2000's are over. granted, you'll notice in recently years the stock's price has shot through the roof. which scares me. it's all hype and it's all speculation. don't get me wrong, i love apple. i buy a new iPod whenever they release one (i have three: a mini, a nano, and a video iPod) and i love their laptops (i have two: a 12" powerbook and a 13" macbook). but as much as i love their company, i refuse to buy into apple's stock. mainly because of one reason: Steve Jobs. the stock rides too highly on his shoulders. apple and Steve Jobs are synonymous with one another. 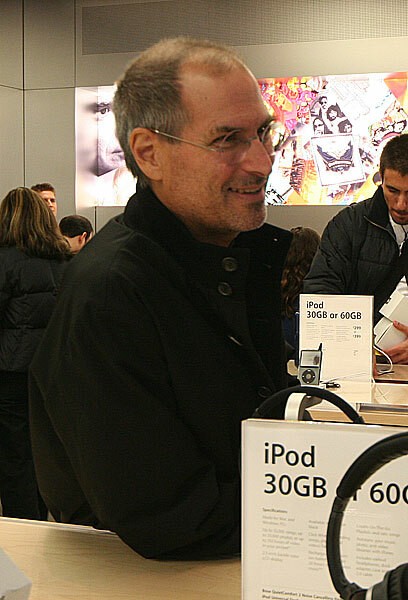 he is THE driving force behind their innovation; what would a Macworld product release look like with no Steve Jobs? how do you introduce new products and services without Steve Jobs? in my opinion... you can't. he is too much of an iCon. i'm not the only one that thinks this way. read the last paragraph of the article; it sums up everything i've just ranted about. i think i'm going to stick with index funds. read Winning the Loser's Game, it will give you a common-sensical guide to investing in the stockmarket. *disclaimer* this is my opinion and in no way should this post be used for financial or investment advice. the information is for informational purposes only.